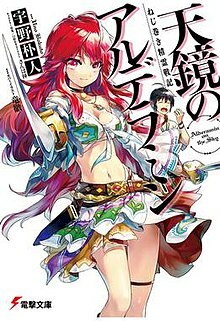 Alderamin on the Sky (ねじ巻き精霊戦記 天鏡のアルデラミン, Nejimaki Seirei Senki: Tenkyō no Aruderamin, lit. "Wind-Up Spirit Chronicles: Alderamin on the Sky") is a Japanese light novel series, written by Bokuto Uno and illustrated by Sanbasō (volumes 1-5) and Ryūtetsu (volume 6-14) between 2012 and 2018. A manga based on the series, written by Taiki Kawakami, is published in Dengeki Daioh. An anime adaptation produced by Madhouse and directed by Tetsuo Ichimura premiered on July 9, 2016. The cover of the first light novel. The main protagonist of the series. Even though he is an extremely intelligent war strategist, he abhors war and despises being assigned as a soldier, due to what happened to his father Bada Sankrei. He is quite frank and has no trouble voicing his opinions (which are usually pessimistic but truthful), however aggravating it may be. Slothful by nature, he has a habit of ending battles in the most convenient way possible. He enjoys chasing after older women, primarily Haroma, and hates handsome men. The main female protagonist of the series. Due to a deal made between her and Ikta, both have become companions since their academy days. She has bright red hair. She wields a sword and a main gauche when fighting, though she uses the parrying dagger in a much more offensive style. She is extremely loyal to the Kingdom and will immediately attack Ikta should he overstep his bounds while complaining about the kingdom to a higher up. Third princess of the imperial family. She joins Ikta's group after he rescues her from drowning. She understands how intelligent Ikta is and how he hides it with his laziness. She holds him in high regard, not just for his intelligence but for his outspoken personality as well, something many lack. She hates how the country is in the latter part of its decline and she wants to destroy it, so it can start over again. She enlists Ikta's help for this as all the others either lack the intelligence, like Torway or Matthew, or are too loyal to the country to destroy it even if it's for the better, like Yatorishino. An academy graduate who meets Ikta and the others on the ship before the exam. He is revealed to be extremely proficient with guns, and can easily hit a target from afar. However he cannot hit a close up target as he cannot view them objectively. Ikta suggests that he pick off the enemy from far as possible so that he cannot see them clearly enough to view them as human, which works very well. Torway loves to nickname people, usually his male friends, even though Ikta is really against it. He uses an air spirit. Ikta's and Yatorishino's classmate in the academy. The three meet each other again in the ship heading for the army exam. His family, Tetdrich, is part of a minor noble family that has a low recognition. He desires to make his family better known. Since Yatorishino and Torway are part of more recognized noble families he sees them as great rivals and often compares himself to them, hoping to beat them one day. He often engages in chess games with all the characters in an attempt to improve his ability of thinking strategically. A nurse who meets Ikta and the others on the ship before their army exam. She is considered very beautiful by Ikta who often flirts with her, which leaves her flustered. She has four younger brothers as stated by her, whom she wants to take care of. She wants to be a nurse in the army, and often takes care of the group. Bokuto Uno began publishing the light novels with illustrations by Sanbasō under ASCII Media Works' Dengeki Bunko imprint in June 2012. After Sanbasō began suffering from poor health, Ryūtetsu took over illustrating the series, starting with the sixth novel. A manga adaptation by Taiki Kawakami began serialization in the July 2014 issue of ASCII Media Works imprint Dengeki Comics' seinen manga magazine Dengeki Maoh on May 27, 2014. An anime adaptation was announced at the Dengeki Bunko Autumn Festival 2015 on October 4, 2015. The adaptation was later revealed to be a television series in the December issue of Kodansha's Monthly Shōnen Sirius magazine on October 26, 2015. A trailer for the series was released during the Dengeki Bunko Haru no Saiten 2016 event on March 13, 2016. The series is directed by Tetsuo Ichimura and written by Shogo Yasukawa, with animation by the studio Madhouse. Kunio Katsuki provides the character designs for the anime, while Yoshikazu Iwanami serves as the series' sound director. Keiji Inai is composing the music for the anime. The opening theme, "Tenkyō no Alderamin" (天鏡のアルデラミン, "Alderamin on the Sky") by Kisida Kyoudan & The Akebosi Rockets, while the ending theme is "nameless" by Kano. The series premiered on July 9, 2016[a] on Tokyo MX. It will then air on KBS Kyoto, Sun TV, TV Aichi, and BS Fuji on July 11, and on AT-X on July 12. Crunchyroll is simulcasting the series on their website. The anime will be released across seven Blu-ray & DVD volumes. The anime is licensed in North America by Crunchyroll and distributed by Funimation, who will provide an English dub of the series. "An Unwanted Medal of Honor"
"The Knights of the High-Level Officer's School"
"Watchdogs of the Spirit Tree"
"At the Base of the Stairs of God"
"Some Day, for the Third Time"
"The Fate of a Small Reputation"
In 2014, the light novels ranked at number ten on the Kono Light Novel ga Sugoi! list of top 10 light novels. ^ The broadcast date for the first episode is listed as July 8, 2016 at 25:05, which is the same as July 9 at 1:05. ^ a b c d e "Alderamin on the Sky Light Novel Series Gets Anime Adaptation". Anime News Network. October 4, 2015. Retrieved October 4, 2015. ^ a b c d e f "Alderamin on the Sky Anime Casts Nobuhiko Okamoto, Risa Taneda, Inori Minase". Anime News Network. December 9, 2015. Retrieved January 19, 2016. ^ a b c d e f g "Funimation Premieres Alderamin on the Sky English Dub, Announces Cast". Anime News Network. December 5, 2016. Retrieved December 5, 2016. ^ a b Chapman, Paul (May 28, 2016). ""Alderamin on the Sky" Announces Opening / Ending Theme Performers". Crunchyroll. Retrieved June 10, 2016. ^ ねじ巻き精霊戦記 天鏡のアルデラミン [Alderamin on the Sky]. Dengeki Bunko (in Japanese). Retrieved June 10, 2016. ^ ねじ巻き精霊戦記 天鏡のアルデラミンII [Alderamin on the Sky II]. Dengeki Bunko (in Japanese). Retrieved June 10, 2016. ^ ねじ巻き精霊戦記 天鏡のアルデラミンIII [Alderamin on the Sky III]. Dengeki Bunko (in Japanese). Retrieved June 10, 2016. ^ ねじ巻き精霊戦記 天鏡のアルデラミンIV [Alderamin on the Sky IV]. Dengeki Bunko (in Japanese). Retrieved June 10, 2016. ^ ねじ巻き精霊戦記 天鏡のアルデラミンV [Alderamin on the Sky V]. Dengeki Bunko (in Japanese). Retrieved June 10, 2016. ^ ねじ巻き精霊戦記 天鏡のアルデラミンVI [Alderamin on the Sky VI]. Dengeki Bunko (in Japanese). Retrieved June 10, 2016. ^ ねじ巻き精霊戦記 天鏡のアルデラミンVII [Alderamin on the Sky VII]. Dengeki Bunko (in Japanese). Retrieved June 10, 2016. ^ ねじ巻き精霊戦記 天鏡のアルデラミンVIII [Alderamin on the Sky VIII]. Dengeki Bunko (in Japanese). Retrieved June 10, 2016. ^ ねじ巻き精霊戦記 天鏡のアルデラミンIX [Alderamin on the Sky IX]. Dengeki Bunko (in Japanese). Retrieved June 10, 2016. ^ ねじ巻き精霊戦記 天鏡のアルデラミンX [Alderamin on the Sky X]. Dengeki Bunko (in Japanese). Retrieved June 10, 2016. ^ ねじ巻き精霊戦記 天鏡のアルデラミンXI [Alderamin on the Sky XI]. Dengeki Bunko (in Japanese). Retrieved September 17, 2016. ^ ねじ巻き精霊戦記 天鏡のアルデラミンXII [Alderamin on the Sky XII]. Dengeki Bunko (in Japanese). Retrieved November 4, 2017. ^ ねじ巻き精霊戦記 天鏡のアルデラミンXIII [Alderamin on the Sky XIII]. Dengeki Bunko (in Japanese). Retrieved November 4, 2017. ^ ねじ巻き精霊戦記 天鏡のアルデラミンXIV [Alderamin on the Sky XIV]. Dengeki Bunko (in Japanese). Retrieved August 10, 2018. ^ 戦乱を生き抜くラノベ「天鏡のアルデラミン」がマンガ化. Natalie (in Japanese). May 27, 2015. Retrieved June 10, 2016. ^ ねじ巻き精霊戦記 天鏡のアルデラミン1 [Alderamin on the Sky 1]. ASCII Media Works (in Japanese). Retrieved June 10, 2016. ^ ねじ巻き精霊戦記 天鏡のアルデラミンII [Alderamin on the Sky II]. ASCII Media Works (in Japanese). Retrieved June 10, 2016. ^ ねじ巻き精霊戦記 天鏡のアルデラミンⅢ [Alderamin on the Sky III]. ASCII Media Works (in Japanese). Retrieved June 10, 2016. ^ ねじ巻き精霊戦記 天鏡のアルデラミンIV [Alderamin on the Sky IV]. ASCII Media Works (in Japanese). Retrieved June 10, 2016. ^ 天鏡のアルデラミンV [Alderamin on the Sky V]. ASCII Media Works (in Japanese). Retrieved September 17, 2016. ^ 天鏡のアルデラミンVI [Alderamin on the Sky VI]. ASCII Media Works (in Japanese). Retrieved December 10, 2016. ^ 天鏡のアルデラミンVII [Alderamin on the Sky VII]. ASCII Media Works (in Japanese). Retrieved December 10, 2016. ^ "Alderamin on the Sky Anime Adaptation Revealed as 2016 TV Series". Anime News Network. October 25, 2016. Retrieved June 10, 2016. ^ a b "Alderamin on the Sky Anime's 1st Promo Video, Key Visual Revealed". Anime News Network. March 13, 2016. Retrieved June 10, 2016. ^ "Alderamin on the Sky Anime's Staff, July Premiere Revealed". Anime News Network. March 11, 2016. Retrieved June 10, 2016. ^ Chapman, Paul (March 11, 2016). "Madhouse Animates "Alderamin on the Sky" TV Anime". Crunchyroll. Retrieved March 11, 2016. ^ "Kishida Kyōdan & the Akeboshi Rockets, Kano Perform Alderamin on the Sky Anime's Themes". Anime News Network. May 29, 2016. Retrieved June 10, 2016. ^ a b "Alderamin on the Sky TV Anime Premieres on July 8". Anime News Network. June 10, 2016. Retrieved June 10, 2016. ^ "放送情報決定" (in Japanese). Retrieved June 25, 2016. ^ "Crunchyroll to Stream 91 Days, Taboo Tattoo, Orange, Mob Psycho 100, Sweetness & Lightning, Alderamin on the Sky". Anime News Network. June 21, 2016. Retrieved June 21, 2016. ^ "Crunchyroll, Funimation Announce Partnership to Share Content Via Streaming, Home Video, EST". Anime News Network. October 4, 2016. Retrieved October 16, 2016. ^ "Funimation Announces Fall English Dub Line-Up". Anime News Network. October 4, 2016. Retrieved October 8, 2016. ^ "STORY" (in Japanese). Retrieved July 8, 2016. ^ "ねじ巻き精霊戦記 天鏡のアルデラミン - アニメ - TOKYO MX" (in Japanese). Tokyo MX. Retrieved July 9, 2016. ^ "Kono Light Novel ga Sugoi! 2015's Series Ranking". Anime News Network. November 23, 2014. Retrieved June 10, 2016.